It's about time for our community to work together and help the server! and a lot of our guides, need to be renewed too. DRO is a server with tons of unique contents including custom quests, dungeons, items and so on. Everyday we get players who are playing in the server for the first time and they easily get overwhelmed by these stuffs. 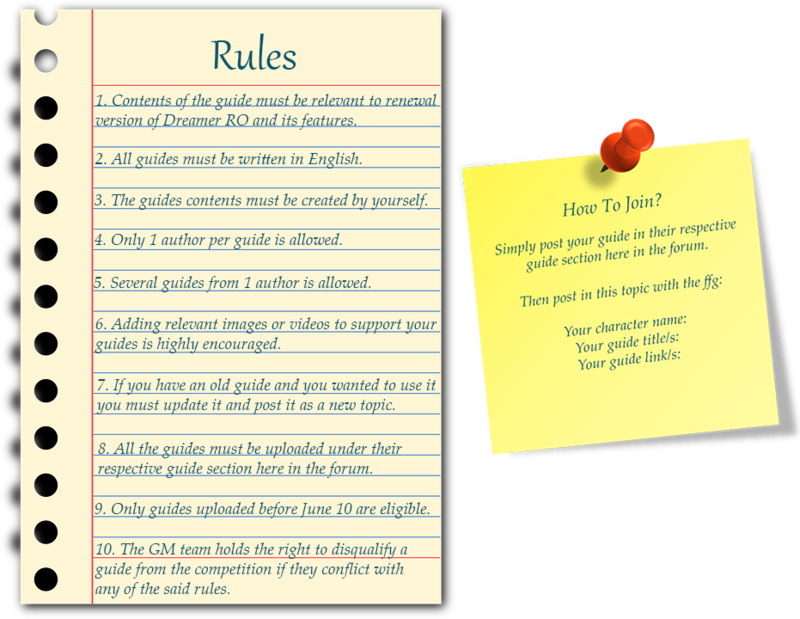 our Elite Veterans, the legend and the myths of our server to participate in our Guide creation contest. Lend a hand to our new players and earn reward through writing GREAT GUIDES, with quality contents. Your guide will not only help our new players, but it will also help us to focus more on creating new contents. Post in this topic with your in game character name, your guide title/s and guide link/s. For old macro guides, you don't need to post it as a new topic. However make sure to make it creative and superior so it will stand out with the rest of the guides. The top 3 winners will receive a rare of their choice. 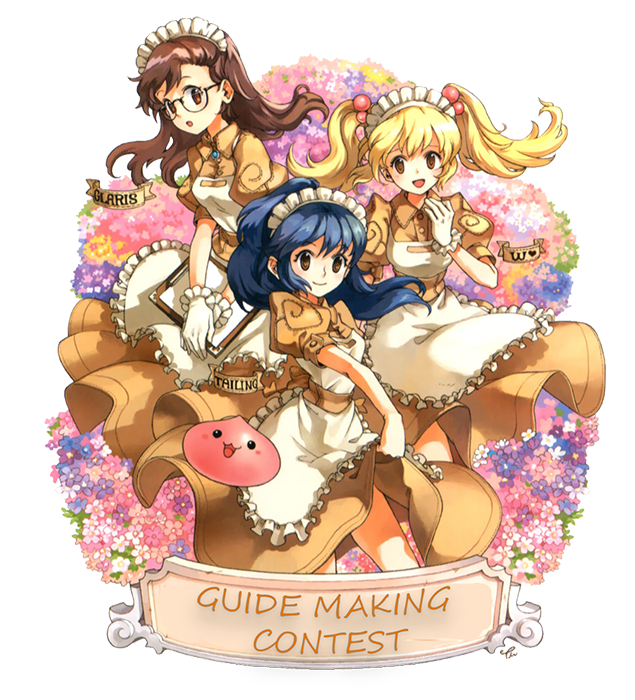 An honorable mention will be rewarded if we think a guide deserves a mention due to creativity, originality, overall value to the community, etc. All the honorable mention winners will get zeny bags as rewards. You have until June 10 to plan and create your guides. hmm i guess i could update some of my marco guides and make some new build guides as well. You need to post it as a new topic, also follow the format for easier evaluation. Make sure that it is fully updated. You still have a lot of time, don't rush. We also wanted to highlight all of the updated guides by our veterans so it will be easier for our new players to see them. Some of our new players are getting confused with the old guides that no longer work with the server, that's why we wanted you guys to post it as a new topic. I like this event, it makes the forum alive again..so happy to read here while away from Dro. Last 3 days for those who like to participate. Players should be able to post in the topic now. Title: Caspen ( GX ) Earth Resist Cheap build and still Working. Goodluck to those who joined. RG Guide by Dichaerchus - A great guide. This is the type of guide I want to see for Job guides. He explained the skills and offer alternative gears. [Donators] How To Utilize your donation. - some donators honestly end up spending their credits on wrong items and regretting it later. A guide like this can be really helpful for them. If they atleast read it. RG Grandcross Guide - Grandcross is currently one of the best farming skill in the game atm. A simple guide about the skill can greatly help new players as well as some veterans in farming and doing their instances. I was honestly hoping to see more guides created and I don't really mind giving rewards for players who put efforts on creating their guides. Too bad only few participated . It's not that hard to create a guide, and your simple effort could help a lot of other players in the game. Anyway For top 3 send a ticket to administrator's support department to claim your prize. For honorables send an @request in game and look for me to receive your reward. I will be the one to reward you. I am pretty active in game, just hiding. If I am not online just try again later. Lastly, thank you very much for everyone who participated in this event.